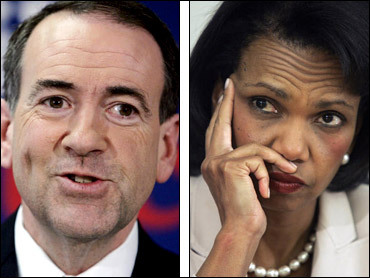 Rice: Huckabee's Criticism Is "Ludicrous"
In a brief foray into politics, Secretary of State Condoleezza Rice on Friday denounced comments by a leading Republican presidential candidate that the Bush administration's foreign policy is arrogant and unilateral. "The idea that somehow this is a go-it-alone policy is just simply ludicrous," she said at a State Department news conference. "One would only have to be not observing the facts, let me say that, to say that this is now a go-it-alone foreign policy." Her remarks came in response to a question about criticism from former Arkansas Gov. Mike Huckabee, who has surged in the polls to become a front-runner in the upcoming Iowa caucuses for the GOP presidential nomination. Huckabee recently said the administration's foreign policy was characterized by a "bunker mentality." Rice did not mention Huckabee by name in her response and at first declined to respond, saying dismissively: "Look, I don't comment on other people's comments. I don't have time, all right. I really don't have time to worry about this." But she then launched into a vigorous defense of the administration's multilateral diplomatic efforts on Afghanistan, North Korea and Iran, and pointed to improving ties with traditional allies in Europe, some of which were strained by the Iraq war. "We have right now probably the strongest trans-Atlantic relations ... I would say in a very long time," Rice said, noting in particular Britain, France and Germany. "We're working with allies in Europe, Russia and China on Iran. The (NATO) alliance is mobilized together in Afghanistan," she said. "We had 50-plus countries at Annapolis to launch the peace process between Israelis and Palestinians. We're working together with allies in Lebanon. "I can go on and on and on and on," Rice concluded. "And so, I would just say to people, look at the facts.